it was one of the most random decisions i have recently made. i mean, what's in taiwan? i wasn't aware, and my ignorance shook me with excitement. not knowing what i would find in this prosperous northern neighbor endowed me with a few expectations, but i was more concerned with the purity of my blind adventure. i quickly booked a promo flight on PAL's econolight and processed my visa application. i bought insight guides on taiwan and plotted a course for some hikes near and around taipei. but in the whole, i just wanted to throw myself there, and see what happens. i hadn't even made reservations with a hotel. i basically just googled taipei+backpacker, and got a few results. it is perhaps a testament to my navigational skills that i found my hostel on the first try, and that i managed to find landmarks in a city that unfolds like a grid, whose square corners resemble each other. 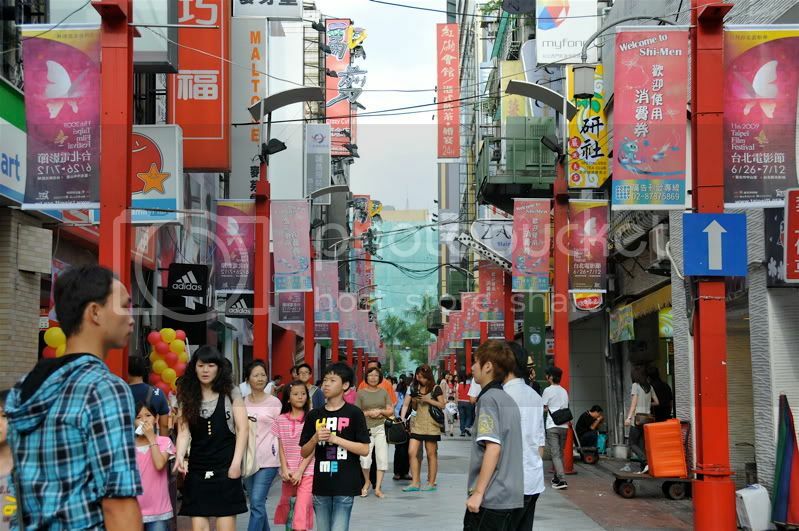 getting around in english-unfriendly taipei is a lesson in patience and perseverance. i had regretted not buying a periplus map before i came, but i suppose it was part of the thrill. i snatched a map from the MRT station and set about looking for certain places on foot. they didn't necessarily look like they were close to each other on paper, but i kept telling myself: i had walked farther distances. what compounded the city hike was the fact that it was difficult to find pegs: there's a 7-11 in every street corner, sometimes within 50 meters of the last one, and most of the characters are in traditional chinese -- not that i could even understand simplified chinese to begin with. strangely, street names aren't placed on street corners, but on traffic lights. so if you're standing at a street corner wondering where you are, all the signs are facing away from you. not that it would help heaps: many of the places have romanized versions of their chinese names, but these are translated phonetically, so although i have information on a given place grabbed from my guidebook or the internet, it takes a good ear to realize: oh, i'm already here. 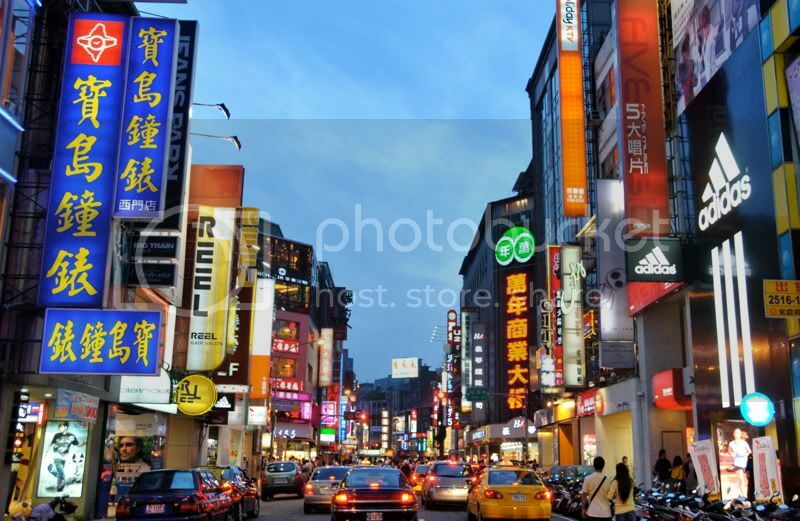 so shimenting is actually the same as ximending, and chengtu could also be chengdu. 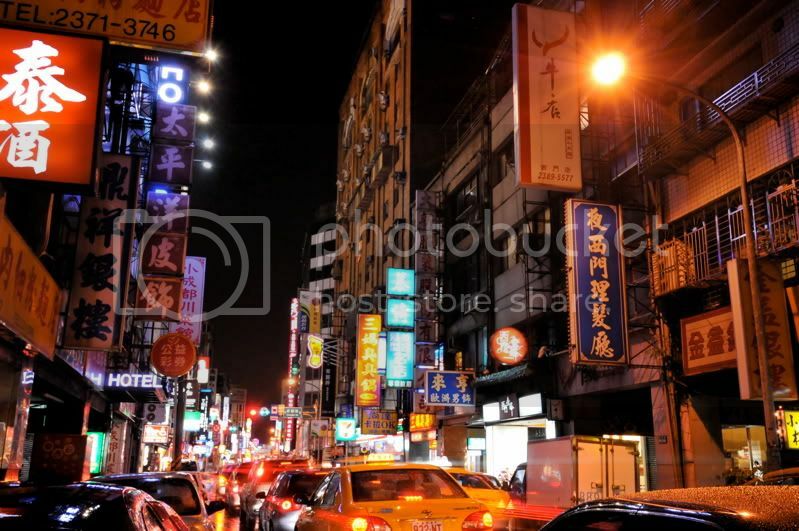 exploring taipei on foot begins with quite a lot of promise, but eventually, most things blur into a template. 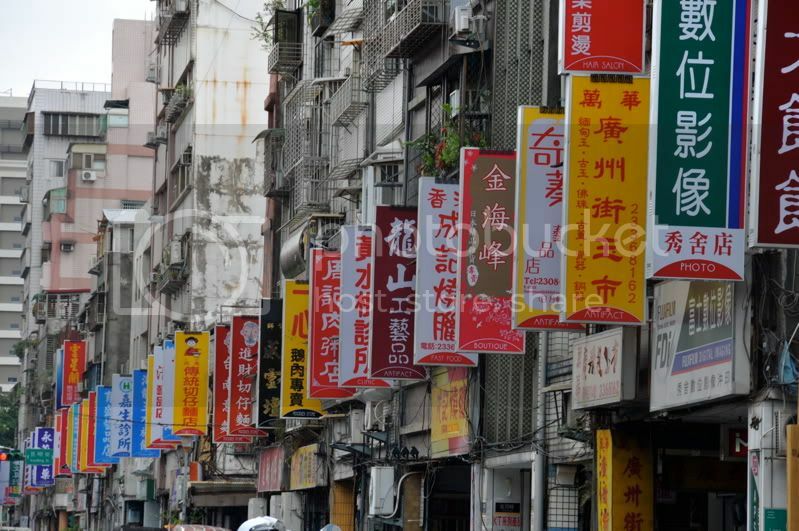 streets are cramped with the vertical alignments of narrow buildings, outside of which hang lighted signs. the first floor usually takes up the business, while the upper floors are reserved for the family's residence. sidewalks are occupied by motorbikes. i read somewhere that taipei could very well be the love child of hong kong and tokyo, but since i haven't been to tokyo, i would even dare say that it is a cross between singapore and saigon: buildings are arranged like a row of books on the shelf, and there are more scooters on the streets than pedestrians. even the narrowest 2-lane street has a traffic light, and people get around the big city using the very efficient MRT. 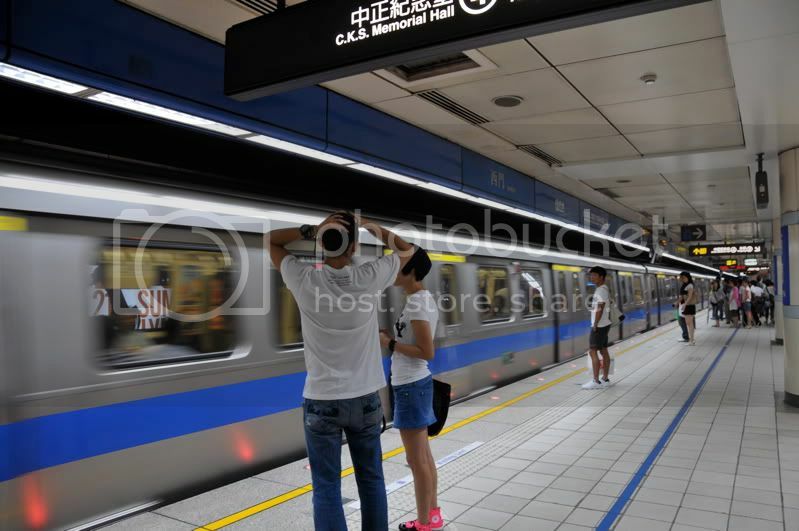 taipei's metro, an expansive, mostly underground rapid train service with at least 7 interchange stations and still 2 lines under construction, is so far the most impressive mass transport system i have seen, though i really have not experienced many (singapore, kuala lumpur, bangkok, hong kong, and manila are my comparators). lines are classified according to colors and also a name. the subway stations are immaculately clean and huge. the elevated stations are also unique in their design, it's amazing. i regret not having been able to explore more of taipei's environs: all the way to danshui in the north, or down to xindian or yongning. but while i had some sketchy plans about things i might do, the weather had other ideas. a few days before i left, i had already checked the weather forecast, and it was bleak: rain on most days, and even a thunderstorm over the weekend. one time, the city fell into so much despair that i locked up in my room and finished a video. i couldn't get around, and while there was much to see in the city itself, i preferred to let my feet take me places: the pouring rain prevented me from my explorations. it was helpful of course that i had selected a hostel which had a central location: close to red house theater, a hop from the ximending pedestrian mall, and about 10 minutes to the themed streets: entire alleys, sometimes spilling over to the next corner, selling the same things or offering the same services. it was an exercise in resisting temptation to just look around camera street and leaving empty-handed. camera street is what i would liken to hidalgo in quiapo, only multiplied by 10, and given a nice shirt. book street wasn't as impressive as i had thought: nothing in english, move along. based on the map, there was also a shoe street, an audio-visual street, and a tattoo street. 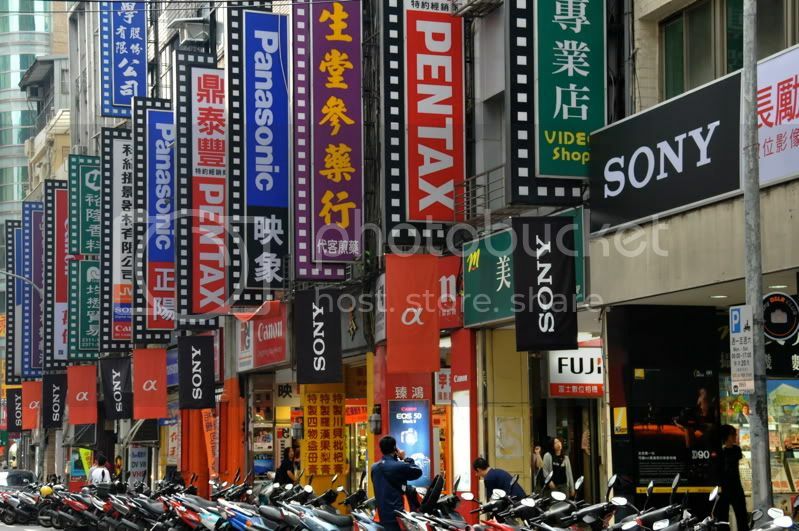 it's part of chinese culture that businesses selling the same things tend to congregate in one place. i'm thankful for uncomplaining feet and comfortable shoes. new cities really are best experienced on foot. i've actually just started with level 8 last week. in 2 and a half months, i would be done with beginner french. on to intermediate, which is another year. haha.